GradesPreK(age 3-1/2) - 6, up to 60 students, one hour in one room. Price is per hour, select number of hours at checkout. Students create "Fun Slime" using basic chemistry and concepts of polymer formation. Due to set-up/clean-up needs, if more than one room is requested OR number of students exceeds 60, time and cost will increase accordingly. Cancellation Policy: If notice of cancellation is received less than 48 hours prior to event, and event is not rescheduled, a $50 fee will be deducted from your refund. Rescheduling Policy: If request to reschedule is received less than 48 hours prior to event, there will be an additional $50 charge. Grades PreK - 8, up to 250 students, FREE WITH FIRST TIME PURCHASE OF ANY SCIENCE PROGRAM. Enter coupon code SSE2FREE at checkout. A variety of fun visual science/STEM activities with students invited up to participate. Science Assembly must occur on the same day as the first booked program. Grades Pre-K to 8, up to 250 students. In addition to a fun, interactive science/STEM stage presentation, Dr. Fun uses the themes in our original children's book "Tyronne Carter Kid Scientist" to show how reading, the library and science can win the day against bullies. 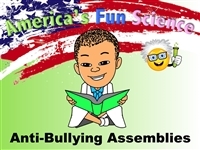 This 20-minute anti-bullying segment is available upon request to add when you book a 30- or 45-minute science assembly. And, one autographed copy of the book is included with this add-on ($14.99 value)! Grades PreK(age 3-1/2) - 8, up to 30 students in one room. Price is per 1-1/2 hour class, select number of classes at checkout. Students create “Fun Putty” using basic chemistry and concepts of polymer formation. Warning: this can get messy! Due to set-up/clean-up needs, if more than one room is requested, time and cost PER ROOM will increase accordingly. Also, class size limit is necessary as the putty formation process takes longer than slime. *If, based on a head count the day of the event, or information conveyed in advance, numbers exceed 20 per class, additional charge will apply. Cancellation Policy: If notice of cancellation is received less than 48 hours prior to event, and event is not rescheduled, a $50 fee will be deducted from your refund. Rescheduling Policy: If request to reschedule is received less than 48 hours prior to event, there will be an additional $50 charge. Pre-K (ages 3-1/2 - 5), up to 250 students. A variety of fun visual science/STEM activities with students invited up to participate. Fun Science with Electricity - "Bots Good"
Grades PreK(age 3-1/2) - 8, up to 20 students/class. * We provide a solid theoretical understanding of electrical circuits and magnetism with a range of simple electrical robotic-related activities. Grades PreK-3: students learn to program a Bee-Bot®; additionally grades 2-3 assemble a magnetic LED throwie. Grades 4-8: hands-on brush-bot creation class culminating in a brush-bot race. NOTE: Bee-Bot operation requires ample hard surface floor space. Grades PreK(age 3-1/2) - 6, up to 20 students/class. * Introduction to flapping butterfly aircraft design and construction in a fun, hands-on setting. Students learn the basics of Ornithopter design, and become familiar with the theoretical basis of lift created via flapping wings while coloring their individual butterfly wings with crayons and assembling a butterfly ornithopter. Pre-K (ages 3-1/2 - 5), up to 20 students/class. * Fun hands-on rocket building class resulting in each student building a reusable, indoor flyable paper rocket.